Does Nokia have battery life concerns with flagship Lumia 1020? 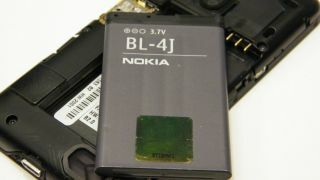 The name is still anyone's guess, but the battery inside the hotly tipped Nokia Lumia 1020 (or is that the Nokia 909?) may not be up to much after a charging shell appeared online. A snap of the accessory was picked up by Russian site Izvestia, and details which accompanied the photo suggested it would provide users with an additional 35 per cent battery life. Apparently the Nokia-branded accessory packs a 1020mAh battery into the clip on shell, complete with sizeable porthole for that much-rumoured 41MP PureView camera. That said, 1020mAh is relatively small for an external charging pack, with cases usually packing larger batteries at the expense of a bulkier design. Usually these cases are produced by third party manufacturers and it seems a little odd that Nokia is making one itself. It raises our suspicions that the Lumia 1020 may struggle to see out a whole day on a single charge. Luckily all our questions will be answered later this week as Nokia is due to reveal its next flagship smartphone - originally touted as the EOS - in New York on Thursday, and we'll be there to bring you all the latest.